GMMF1.NET has put together an interesting article regarding the introduction of KERS next year. Although it is normal for doubts to be expressed over any change in F1 rules, the number and status of those having misgivings, as revealed in the article, is worrying, to say the least. Careful, don't touch the car! Following the problems encountered by teams in the development of KERS systems for 2009, it is now suggested the voluntary debut of the technology might need to be delayed. The highest profile problems experienced by teams include the recent smoke and fume incident at Red Bull's UK factory, and the electric shock sustained by a BMW-Sauber mechanic at the Jerez test this week. Toyota engine boss Luca Marmorini tells the German magazine Sport Bild: "All teams are having problems at the moment. "Building a safe system is proving a difficult thing. For 2009, time is running out," he added. "To me, it would be more logical to test it for a year before we use it at the races. For us at Toyota, safety has the highest priority," Marmorini said. Williams driver Nico Rosberg explained: "For the first few races (of 2009), no team will be on the grid with KERS. "It is Williams' plan to introduce it for the first race, but that is a big task," the German driver added. Honda team principal Ross Brawn is believed to have said a similar thing. Renault team boss Flavio Briatore told the German newspaper Bild-Zeitung: "If the system is not safe, we will not put it on the car." Speaking for the drivers' safety union the GPDA, Mark Webber said: "Some teams are having problems with the chemicals that are used for the batteries. "It is important to us that it is safe, when we are driving at 300kmh, or in the event of a heavy accident." That is an impressive list of doubters. When we include the fact that the value of KERS is largely offset by a weight penalty and that its intended use is to be by a "push-to-pass" button, surely anathema to any F1 fan, the whole idea has to be questioned. This was a cosmetic addition introduced by Max Mosley in an attempt to make the sport appear more environment friendly and, quite frankly, it does not fool anyone. Early experiments have proved it to be complex, difficult to implement and dangerous in ways that were not anticipated. It looks to me as though F1 could save itself enormous expense and difficulty if the rule were to be scrapped now, before the teams invest too much in it. Even to delay its debut for a year is to ignore the fact that it was an attractive notion that will never deliver on our expectations of it. The only place to find a free lunch these days is on the internet and KERS is anything but free energy for no cost. If F1 is to be genuinely concerned about the environment, it has to be interested in alternative fuels. Anything less is a compromise and a cosmetic application while the engines continue to burn off fossil fuels that are finite in supply and damaging to the atmosphere. What frustrates me more than anything else in the matter of the greening of motor sport is the continuing ignorance of fuels that offer a viable alternative right now. Hydrogen may not be the fuel of the future (although I think it is) but it is certainly available now and requires very little change to the engine and systems to work as efficiently as gasoline. As a stop-gap measure, it is the obvious answer. But no, instead of looking at alternative fuels that will make the sport truly environment-friendly, the teams are expected to fiddle about with costly add-ons that require a great deal of development time before becoming workable and, in the meantime, the original intent to make the sport greener is forgotten. Do not be fooled; Mosley is not interested in making F1 green, he is only concerned with making it appear green. As part of his campaign to stay on as FIA president, Mosley has recently asked the teams to submit their suggestions for F1 in the future. A first meeting was held over the German GP weekend to begin to thrash out some ideas. Judging by previous experience, however, it is all a waste of energy and time - Mosley never listens to such suggestions and just throws them out in favor of some half-baked scheme of his own. We are saddled with a five-year engine freeze as a result of his last attempt to appear reasonable. Sooner or later the teams are going to have to recognize the fact that F1 is being destroyed by Mosley's continued tenure. As the ones with the biggest stake in the sport, they are going to have to stand up to the FIA and insist that he go. And, if that means a breakaway series, then so be it. This is a great post, very informative lots of insight into the whole F1 environmental situation. I think i have mentioned this before, but just for the sake of it, i will tell you abou it again. The only engines without any environmental effects, atleast not when it comes to using them on the road, are the electrical engines. Just the thought of letting all the excellent engineers of F1 and a glimpse of this video http://www.youtube.com/watch?v=8qDZOBQs60w will certainly make them look really apealing. But, as you say Clive. As long as Max is seated behind the desk at FIA this is not going to happen. Sad, but all true. Hydrogen is about the most explosive substance known. That's why it is rocket fuel. not my idea of safe. to the engineers to figure the solution. My proposed rule changes for 2009. Let the teams figure it out in open technological competition with each other. The other problem with KERS is that its road car application is fundamentally flawed. If someone is interested enough in green issues to have it fitted presumably they are interested enough to learn to drive in the way that burns least fuel. That means using acceleration sense and getting off the throttle at the approach to any stop and let the speed decay. In the end only using the brakes for the last part of the speed reduction. Anyone driving like this is going to produce no significant braking energy because if they half their speed before they brake they have saved 75% of the braking effort. So they are lugging round a heavy KERS system for no real benefit and that isn't very green. If I was going to do an energy recovery device I would recover exhaust heat or extract energy in the form of heat from the radiator. These have the advantage that energy can be recovered for the full duration of the journey regardless of speed, stopping etc. Much easier to optimise the efficiency of a heat recovery system when you have a constant supply of energy than to use a kinetic energy recovery whe you are getting energy at random intervals. I think you hit the nail on the head there, Clive. Making the sport 'green' and making it 'appear green' are two entirely different things ! But in any case, I am sure that the myriad of designers, aerodynamicists etc that are employed by the teams could find much better ways to reduce fuel consumption, use alternative fuel sources etc if they were given the directive to do so. After all, that is their area of expertise. What was S&Max's again? Steven Roy, I was waiting for you to bring up the Stirling engine again ! At last I my awareness campaign for the Stirling engine is working. The thing is all sorts of heat recovery could be used and recovery more energy and be more efficient than KERS. KERS on a race track is fine especially somewhere like Montreal where they go from 200mph to 70 4 times a lap but in normal driving it is stupid. The only reason Max used that as his method of choice was because McLaren had developed one a few years ago which he banned. He probably decided one day he would make it compulsory without thinking of the alternatives. Björn: I agree that electric motors have to the ultimate answer. The problem is that they are not quite practical yet - without a range of 300 miles and similar performance, they will not replace our modern cars. Better batteries may come in time but, for the moment, we must look elsewhere. Peter: Actually, hydrogen is no more explosive than gasoline - it's bad reputation comes from the days of the zeppelins when they took insufficient precautions with a pretty flammable gas. But exactly the same thing would have happened if the zeppelins had been filled with gasoline. But I love your proposals for rule changes in 2009 and beyond. That is the kind of thinking that the FIA should be encouraging, not this ever-increasing restriction on invention and tighter controls. If we can get rid of Max, you have my vote as next president! Steven and Peril: I see have two of you shouting about the Stirling engine now! Fair enough, it certainly merits investigation, but I cannot see the FIA even considering anything so radical at this stage. The beauty of hydrogen is that it requires so little alteration to existing engines before it can work and it produces nothing more dangerous to the environment than water. As an interim measure, I think it has to be considered. Alex Arnet emailed me after being rejected by the CAPTCHA system once too often! He points out that the problem with hydrogen is that it has to be produced by processes that themselves use energy - usually from fossil fuels. In fact, there are other, less energy-intensive ways of producing hydrogen now and it can even be produced on board the car itself. Alex suggests bio-fuels as a better alternative, pointing out that it can be made from wood waste and algae now. But the same problems apply - it requires energy to extract the fuel from such sources, just as hydrogen does. Plus, I cannot see either source being plentiful enough to supply anything like our current fuel needs. That is why I keep harping on about hydrogen; if you want to go green, it is the only viable alternative in existence right now that does not require that we impoverish the third world. In time we might have massive algae farms covering half a continent to supply our needs - at present, we are nowhere near that. a gas at 1atm and track temp. This gives me problems, so did some web searching. Web link I found suggests that most often it doesn't ignite and doesn't hang around (outdoors). Thus chances are it will dissipate, but if it does go wrong ALL the energy of the tank goes up in an instant in huge fireball. That's a big explosion. Kind of three way race between dissipation and oxygen hydrogen mixing and source of ignition. you can get soaked in it. I agree that hydrogen should be used. That is where so many car companies are looking anyway with fuel cells and the like. Hydrogen has an unfair reputation because of some of the airship accidents. If you look at a lot of those accidents the flames are often reported as being yellow or orange but hydrogen burns with a pale blue flame. I saw an investigation into one of the big airship accidents and the conclusion was that although the hydrogen burned it had nothing to do with the cause of the fire. The problem was the treatment used on the envelope material which after a timespan made it very flammable. On touchdown of the drag lines there would be a static discharge which brned the envelope exposing and burning the hydrogen. If you have seen any of these accidents you will notice how quickly the canop burns away. It is almost like a fuse material. Nuclear plants could easily produce hydrogen. Not to play devil's advocate, but I think Max et al. wanted KERS to fail in the onset, in the hopes that teams that adopt KERS quickly become the future's winners. Not that it's going to happen that way, I just think that's the goal. It's like they're trying to bring back the turbo era without actually making the engines any better. Peter: Actually, I agree with you about pressurized hydrogen tanks. But it is now possible to create hydrogen as and when it is needed, thanks to a process discovered at Perdue University. Add water to pellets of a certain aluminum alloy and hydrogen is given off. They are working on marketing the process. Interesting point about Parisian riots, however. Not sure how they would contain the hydrogen until it was "required" but it could give the Molotov cocktail a whole new lease of life! Steven: I remember watching a documentary about that some time ago. Hopefully, we have learned our lesson and are a bit more savvy about how to use hydrogen safely nowadays. Chunter: Interesting theory. But I doubt that Max thinks about the practicalities. As Steven mentioned, he probably got the idea from McLaren's experiments and thought it could be done just like that. I know Max is supposed to have engineering qualifications but, judging by the performance of the March cars, I don't think he was ever exactly a brilliant engineer. Actually, there was an article in the local paper today about how Renault have built a prototype Hydrogen Scenic. The catch is, it cost $2 million to build :( Although, an F1 team probably could afford to build one at year, which may help with the transition to road cars & the cost coming down. The best thing would be if the regulations allowed a variety of different methods of powering a car, with petrol refuelling banned but only safety regulations being employed otherwise. In a stroke, it would encourage the F1 engineers to figure out which of the alternatives was the best, encourage research in several different directions and make F1 greener (not just make it look greener). Eventually, it would be clear in the white heat of battle which solution(s) were the best. It would also help if stuff was done to make the planes the F1 brigade travel on greener as well. I agree with a lot of the comments here that KERS isn't ready for F1 but that's Max's point, Kers is already in use on road cars. The Prius for example gets 3Mpg more than my current 2 litre Civic type R (when it's driven sensibly) the reality of the Prius is that it is giving the apperence of being a greener option while in reality it's actually worse because of the massive Carbon footprint they have before the ever reach the customer. It makes so much sense to have the most talented automotive engineers in the world all working on this tech as it seems to be getting acceptence with the public and I have no doubt that F1 engineers will make it far more efficient and then maybe the green claims of hybrids may actually deliver on the promise. But free the engineers to let loose on their own theories and all of a sudden each team will be working on different green techs and progress will be a lot slower for each of those technologies. With all due respect to the tree huggers of the planet. Motor racing is about motor racing not about developing bits for road cars. The manner in which racing cars perform and are driven bears no relation to road cars and technology that improves racing performance does not necessarily transfer to road cars. This season we have had the best season's racing for a long time and there is one reason for it. The technology has been dumbed down a bit and the technical geniuses have been restricted. Dumb technology makes for good racing. The more technically advanced and diverse F1 gets the more one team is going to disappear into the distance at every race and in every championship season. F1 need KERS like a fish needs a bike. There is no reason for F1 to become more high tech or to get into energy recovery. There is no reason beyond Max's ambitions why F1 needs to be road relevant. No-one expect's Nike football boot design to be relevant to normal shoes anymore than Andy Murray's tennis racket design should affect the design of frying pans or fly swatters. Let racing be racing and keep the technology to a manageable level and you will get better racing. There are other alternatives to petrol too. There is at least on set of scientists that have found a way of using iron filings as a fuel. Even better, these iron filings are collected within the system and can be regenerated to be used again, and again! The problem currently lies with getting this iron filing fuel through the cumbustion system effectively. The other benefit though it that normal engines can be modified to use this system. I agree with the post above though about setting a limit to the amount of fuel that they can use and let the engineers come up with the ideas to get around the problem. Infact I was discussing this with a friend when the KERS proposal was brought in. It seems far more sensible and more practical in terms of delivering the lessons to the domestic car industry. Steven Roy, With all due respect, it is not all to do with tree hugging. Our children are suffering more and more from asthma and other respiratory problems caused by pollution. Much of this low level localised pollution is generated by internal combustion engines. Also there are problems involved due to the west not being in control of our energy supplies (oil, gas) so if the middles east and Russia decide to stop supplying the oil we will see both a giant war and economic meltdown. It is in out interests to find better ways of powering our transport and you are wrong about F1 not being about developing road cars. The technology developed in F1 (and other similar racing events) has nearly always made it to the road eventually and indeed is one of the major reasons companies like Ferrari, Honda, BMW and Toyota and Bridgestone race in F1. Flappy gear changers, better tyres, aerodynamics, and engine technology are all born from racing. Peril: Many manufacturers have quite workable hydrogen-powered prototypes running. Taken as single units, these have cost millions to develop but all prototypes are expensive to build because of the research and testing that has gone into them. Production of a finished design is much cheaper because the work has been done and there are economies of scale. Some manufacturers could and do have hydrogen cars for sale already (BMW are currently advertising theirs in the States). So the technology has already been developed and I see no reason why it should not now be introduced into motor racing. 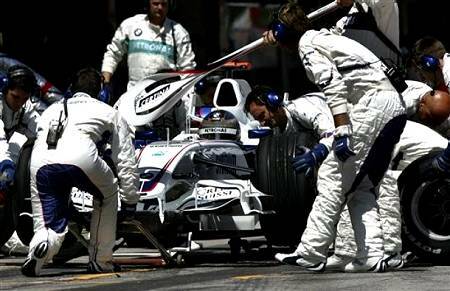 Although the idea of allowing F1 teams to choose any alternative fuel to petrol/gasoline is very appealing. I agree with Lee, and to be honest with almost half of my nieces and nephews suffering from Asthma when there is no family history, the sooner Techs like KERS Fuel Cells etc. are made efficient and implemented the better. The quickest way to achieve that is to have the best engineers working on it and when it comes to the automobile, F1 is where you find the best. Alianora: I agree that it would be a good idea to let the F1 teams find out for themselves which alternative fuel source is best for racing. My fear is, however, that this would lead most of them to take the easy route and use bio-fuels, which are similar to gasoline and apparently green. The problem is that most of these fuels at present come from food crops and the price of food is forced upwards as a result, with grave results in the third world that cannot afford such increases. As I have already mentioned, it is all very well talking about wood waste and algae but, until the sources of supply of these alternatives are developed, bio-fuels are not really a valid option. So I would favor an opening out of the rules to include alternative fuels with the exception of bio-fuels. There are some things that have gone from racing into road cars but there are things like traction control, abs etc that have gone from road cars into racing but no-one thinks road cars should be made more race relevant. My point is that to use racing to blindly develop energy recovery technology is stupid. A properly driven road car will get little or no benefit from KERS regardless how efficient the device eventually becomes. In a city centre maybe there could be a benefit but imagine the number of long motorway journeys that are undertaken where several kg of KERS has to be carried at the cost of more fuel consumption and only gives a return on the very rare occasions that the brakes are used. With the exception of the M25 KERS on most motorway journeys will increase fuel consumption not decrease it while at the same time vast amounts of energy is being vented to atmosphere in the form of excess engine heat. Where is the sense in developing a technology that helps for a short period in a percentage of journeys when they could be developing a technology that could help all the time during every journey. Heat recovery could be used to charge batteries while the car is sitting cooling down after a journey. How often have you opened a car door and had to step away from it because the car has been sitting in the sun? That heat could be recovered and used but instead we are going to ruin racing and put lives at stake developing a technology which will in all probability give a net increase in terms of carbon dioxide. Imagine how many times you would have to use a KERS device to overcome the CO2 produced in its manufacture, shipment, raw material production etc etc etc. KERS will not help anything. It is complete fantasy to believe that KERS will cut CO2 production. KERS is about Max being seen to be green and creating another way of drivers changing positions falsely on the track. While we have teams working so hard to save the planet I notice in the latest F1 Racing that Bridgestone makes all its F1 tyres in Japan and ships them to its European HQ to then be shipped to the circuits. Surely if Max wants to save the planet he should insist on tyres being made in Europe. But of course in F1 green equals KERS and everyrthing else is ignored. George: I am glad you mentioned the Toyota Prius, that figurehead of the allegedly green cars. As you say, it is not nearly as green as hyped but also it is a hybrid, saving on fuel by having an electric motor in addition to its internal combustion engine. That is where its claim to fame lies and not in KERS (I don't know if it uses KERS but, even if it does, the contribution towards energy-saving must be minimal at best). It is true that the F1 engineers should be released upon one major task at a time but I don't agree that KERS is a suitable place to begin. It seems to me that the area in which the greatest saving on energy can be made are in alternative fuels and we would not be expecting racing engineers to develop road-relevant technologies as a result. Those will come, as they always do through work done in the sport, but they should not be the primary aim. The goal should really be the abandonment of fossil fuels as an energy source in racing - KERS just helps to prolong F1's dependence on a finite fuel source. I have no idea where you are getting your information from but it is wrong. The turbo was used on ships, locomotives and planes before it ever appeared on a car. It was used in production cars for years before it appeared in F1 or even in the other racing championships that beat F1 in using it. Gottlieb Daimler invented the supercharger in 1885 before racing had been thought of. Seatbelts were first used in planes then road cars then racing cars. Seat belts were not used in F1 until the 1960s long after they were used in road cars. Racing theory was that the best thing that could happen in an accident was that the driver was thrown out of the car. I kid you not. The first patent for 4 wheel drive was granted in 1893. I could cut F1 fuel consumption by 30% instantly. Take the wings off. F1 cars are less aerodynamically efficient than a brick. I can't remember the drag co-efficients but the brick is has substantially less drag. While Max is screaming about saving the planet vast amounts of fuel is being burned to drag wings through the air. Doesn't sound very green to me. Lee and Steven (and George too! ): If I may enter the debate at this stage and with all due respect, I think you're both right! There have been many technological developments within F1 that have been used in road cars but never has the primary aim been to employ the sport as a test bed for road-relevant technology. That has always been an accidental by product of technology from F1 and it should remain so, if we are to retain the ethos (and yes, irresponsibility!) of motor racing. When I was young, it used to be said that a racing engine should produce 100 bhp per litre; these days, you can expect that from a reasonable sports car on the road and racing engines produce many times more per litre. That speaks volumes of how much more efficient the petrol engine is today and it has happened because the F1 engineers wanted more power from a given amount of fuel - to go faster, not to put into any road car! But we need to face the fact that fossil fuels are limited in supply and subject to political pressures as to their availability, as well as being pollutants. To put it in a nutshell, we only have so much oil and need to be looking for alternatives before it runs out. There is no reason why F1 should not lead in the search for viable alternatives. KERS is a smokescreen of greenness, however. Regardless of how efficient F1 could make it, it still makes no stipulation that gasoline not be used. It is, in fact, a way of preserving the old technologies that we should be trying to get rid of. Steven is correct in saying that energy from exhaust heat would be more valid than braking energy but this still avoids what, for me, is the central theme in any discussion of energy-saving measures - alternative fuels. Let us use clever tricks like KERS on production cars as an addition to the main drive towards other fuels. But racing needs to have an open field for competition between engineers and to allow them to use any fuel other than fossil-sourced is the way to go, I think. well, I agree alternative non fossil based fuels should be the ultimate goal, you have to start somewhere and using the existing fuel supply in a more efficient manner is definitely a start. Steven, you are correct the technologies I mentioned were almost all available and in use before motor racing got to them but it doesn't change the fact that all the tech that I mentioned were refined and some would say perfected for road use within Motorsport. When the Turbo Era began in F1, Saab already had a turbo charged production car, however it was prone to blowing turbo's. Land rover, jeep et-al had been making 4 wheel drive for decades before it entered motorsport. When Bentley strapped superchargers to there cars people thought they were crazy as it was known as a problematic device. Bottom line the link between racing and road use is weak at best these days but my own belief is that if Motor racing is not to go the way of the Fox Hunt in these politically correct enviro friendly days is, if it gets more relevant. "When I was young, it used to be said that a racing engine should produce 100 bhp per litre; these days, you can expect that from a reasonable sports car on the road and racing engines produce many times more per litre. That speaks volumes of how much more efficient the petrol engine is today and it has happened because the F1 engineers wanted more power from a given amount of fuel - to go faster, not to put into any road car!" BHP efficiency per "litre of fuel per minute". at a given RPM to get more power. George: Agreed that F1 needs to be seen to be taking environmental issues seriously. But am unconvinced that KERS will be seen as a good start by the people most likely to raise a ruckus over the sport in an attempt to get it banned - the greenies. They know their stuff and so will know that KERS is more a cosmetic than an effective way to save energy. To keep them quiet, F1 will have to do something much more dramatic. Peter: Okay, you got me - of course the greater power outputs of today's racing engines stem largely from increased RPM. But the fact remains that better fuel-burning makes its contribution too. And production engines have benefited from both advances in technology. Why not use KERS? Toyota are unhappy with the rules because they are running a more advanced system in a 24 sportscar race in Japan no-one outside of that countey has ever heard of. They are having to dumb it down for F1. Who does it help to have all those F1 brains designing, building and testing units that are less advanced than one that one of them already has? How much CO2 is going to be produced with all that activity to produce something that is worse than already exists. Steven, I wasn't aware of that, do you have a link or any other info on this? Steven, F1 needs to be on something other than petrol in the next 30 years in order to ensure its survival. Not because of the environmental lobby - from the lack of petrol to power the cars. If the conversion starts now and is framed in the broadest possible terms, by the three-decade mark point F1 will not only be used to using other fuels, but the fastest, most powerful power source will have been discovered and close to perfected. That's got to be good for the racing - and the competition to develop the different technologies will lead to cars with major differences, which increases the amount of overtaking that will happen. Clive, the problem of biofuels using the food part of crops was resolved several years ago. However, it's not in the interests of the economically developed countries for us to know this. There are biofuels already used in Brazil made from the waste products remaining after sugar cane and castor bean production, which are increasingly popular in that country. At the moment, the waste-product version is still being phased in, but it is being discouraged because the low demand for sugar means that some of the sugar crop would be wasted if it wasn't converted to whole-plant ethanol. The politicians in the economically developed world hate these because most of them live in countries where the climate doesn't suit sugar cane (sugar beet is much less efficient and more expensive - ironically partly due to protectionist measures). They are trying to fight back with cellulose-based ethanol, which have their own problems for soil fertility but promise even bigger carbon savings (since even the waste-product Brazillian method doesn't use the plant at optimal efficiency). Sweet sorghum - an animal feed grown primarily in North America - is also an option, since the food part and the fuel parts are easy to separate. There are still some problems with even the waste-product version of sugar-cane biofuel - large amounts of forest are being razed to provide unsustainable fields for the crops - but proper land management would resolve this. After all, Brazil has a lot of non-rainforest land that could be used for sugar cane production instead. For those who are curious, the reason why algae may yet help with the biofuel problems is that they naturally produce oil, which simply needs heating and a little extra treating to become biofuel. The jatropha plant does the same. It is unlikely that there would even need to be a rule banning food-based biofuel; the waste-product Brazillian version is still 8 cents a litre cheaper to produce than the American-style whole-plant version (I haven't seen the comparison between Brazillian whole-plant and waste-plant versions, but it's probably still in the waste-plant's favour because there are no intermediate steps in the production process) to get the same sort of result. Who's going to pay over 33% more for the same product (other than those who are forced to by protectionist measures)? Alianora: I know that Brazil has used ethanol from sugar cane a part of their fuel requirements for decades. However and as you point out, this gives rise to the problem of land use - how much land can we afford to give over to fuel production while retaining sufficient to grow food? These are problems that will take time to solve, especially when the political factors you mention have so much influence on the question. Hydrogen has been used as a fuel for over fifty years and we are now learning how to produce it on demand and in mobile situations. Surely this has to be a more immediate and workable solution, at least as an interim measure? Luca Marmorini says the F1 KERS is primitive and the Toyota Supra that won the 24hrs of Tokachi had a more complex system. He also says that the Toyota Prius has a more sophisticated KERS than is proposed for F1. I am always sceptical of the idea that we are going to run out of oil soon. The line is always that there are so many barrels of economically viable oil left in the world. What will happen when that stock dries up is that oil that is currently not viable will become viable because of need. Many people who made money out of the oil boom in the USA never produced a cup of oil let alone a barrel. If it was economically viable to go down 100 feet to get oil they went round and bought up land where the oil was 200 feet deep. Once the 100 feet deep oil started to dry up the technical problems and viability of getting oil from 200 feet changed and they sold their land to oil companies for many times what they had paid for it a few years earlier. Only this week it has been announced that they have found a massive amount of oil under the Arctic. With the ice cap melting that become more viable. Now I am not saying it is right to keep using oil based fuels or that drilling in the Arctic or Antarctic is a good idea but the one certainty in all of this is oil will be around for decades after the current forecasts suggest. Personally like Clive I see hydrogen as the future. It burns to produce only water and with fuel cells etc there is no need to carry a tank of hydrogen around. And as Peril pointed out I see many applications for the Stirling engine which despite its vast age is still the most efficient way to convert heat into motion. Quite something but we Scots are clever. For a few years now I have been trying to figure out why there is such a growth in asthma. It is easy to point the fingers at pollution and then cars but I really can't see it is as simple as that. In the last 40 years air quality in cities and towns has become massively better. Maybe not at the edge of the road but generally. We have gone from cities where every house, school, works, office etc had a coal fire and chucked all sorts of rubbish into the environment to a situation where everyone and everywhere has central heating and little or no pollution at the point of consumption. No more do we hear of London's legendary pea soup smogs when it was impossible to see three feet in front of yourself. Yet while people were living in that asthma rates were massively lower than they are now so I think the cause is not just related to pollution. The deeper the oil is, the more expensive it is. And it's got to the point where a lot of people are struggling to afford the resulting products (principally petrol). This effect will continue for as long as oil economic inflation exceeds the general economic inflation - which on the trends of the last 5 years, looks like getting worse not better. The asthma rate is linked to quite a few things; apart from too much pollution, exercise rates, diet, housing (yes I was surprised by that one too), viral infections, workplace irritants and genetics are potentially implicated as well. Smoking is implicated, but that's decreased for all but the most impoverished in society. It'll be a long time before which bits cause what amounts of asthma are disentangled. I'd like to second George's thanks to Clive. Steven and Alianora: I think the last few comments have illustrated very effectively how complex the problem with oil is. Whether we run out of it in thirty years time or three hundred, the fact remains that there earth has a finite supply. To me, that means that the sooner we find alternative fuels, the better. The cost of extracting the oil has not yet risen to prohibitive levels - while it remains so, let us find something to replace it. It's as simple as that. Peter: Thank you very much for the kind comments. I must admit that one of the things I like best about blogging is the interaction with commenters and it is good to see all shades of opinion being represented without rancour or unnecessary argument. I am proud of all who comment on this blog for they make it worthwhile. the driver can simultaneously press. I think it is clearly legal, but the law may get changed. It's off the front page as it is a few days old. Yes, I saw that business about McLaren's clever implementation of gear and map change. As you say it's clearly legal, even if others haven't thought of it yet (I did read somewhere that two or three other teams are doing the same, however). The big question is: does it give enough of an advantage to cause the dominance of Lewis Hamilton in the last two GPs? They've got the same car! latch on to possible external reasons for the difference. as the race pace, so I put it down to skill. off or anything like that. I think I meant Hamilton's dominance over everyone! As you say, Peter, Kovalainen is in the same car but was unable to use it to as great effect as Lewis did. There are rumors that Heikki has not adjusted as quickly to the new system as did Lewis and this would explain the speed gap between the two McLarens - but that also means that Hamilton learns faster than his team mate, surely an important aspect of driving skill too. So yes, I would agree with you that Hamilton is seriously good and will be the man to beat in the coming years. There are still significant advances being made in the engine efficiency field, several of which could band-aid our currently perceived emergency a lot better than this KERS nonsense, especially in it’s current F1 form. Indeed, F1 should be participating, and probably would be, but for the FIA’s shortsighted position on engine development. Since there is no apparent change projected for that body’s senior personnel, it would be illogical to expect much change in way of its flawed thinking either. I retain the hope that these efficiency advances are interim steps toward an eventual cleaner fuel, hydrogen still being the best option as things stand today. An additional interim step? Essentially, an internal combustion engine converts the fuel’s chemical energy into heat, and 1/3 of that process is extracted as mechanical energy to power the car. Could this massive 2/3 heat loss not be harnessed to break water down into it’s component parts H2 + O, then utilized as a significant fossil fuel compliment and a clean burning agent for the fossil fuel still consumed? Finally, few industry insiders believe there is any shortage of ‘reasonably priced’, fossil fuels (so called anyway) today, nor will there be for some time to come, except of course for further contrived instances that by example we’ve now come to expect. a. Reasonably priced, since although the oil companies are producing record profits, those profits fall far short of representing the difference between the well-head cost to produce and the final pump prices charged, even after interim costs such as transportation, refining and reasonable profits are factored in. b. So called, because few in the industry, joined by an ever-increasing number of others, still believe oil is sourced from a blend of dead dinosaurs and decayed tropical forests. David: Thanks for your long and thoroughly-researched comment. I have studied the links you give and agree that there are many interesting advances being made in the design of gasoline-powered engines that would be a good deal more energy saving than KERS. The problem is, as you say, that the present personnel of the FIA seem totally uninterested in any of these, preferring to go for cosmetic solutions that look good but are virtually useless in any genuine effort to make F1 greener. The article on the origin of oil I found extremely interesting - it would explain why, as far back as the sixties, we were being told that oil reserves would soon run out whereas there seems to be plenty of it still around today, despite the massive increase in usage over the last few decades.